If you’re looking for a tour of New Zealand that’s completely stress free, where everything is pre-planned and you can enjoy all the scenic highlights and bucket-list activities and then relax in comfort of 3-4 star accommodation, then look no more! Haka Plus Tours are designed with you in mind! We want to give you an idea of what it will be like on a Haka Plus Southern Pioneer Tour: ten days discovering the best of the South Island with a small group of like-minded adventurous souls – count us in! First things first, you probably want to know who’s on the tour with you. Aside from your friendly and helpful guide (or tour manager), your fellow Haka Plus tour guests are more than likely well-seasoned travellers looking for a bit more comfort and wanting to leave dorm stays behind them. You’ll find that most people on this tour are over 40 years old and are as excited about getting as much from this South Island tour as you are. Upon booking your tour, our Tour Advisors will provide you with all the info you need including packing lists and itinerary confirmations – so all you need to do is arrive in Christchurch before your pre-tour meeting. Our team can even organise airport transfers – we want to make your tour as stress-free as possible. The night before your tour, you’ll settle in to your Christchurch accommodation – a chic hotel located very near Cathedral Square – ready for your pre-tour meeting. This is a chance to get to know your guide and your fellow guests – solo adventurers will find you’re alone no more with a great bunch of new friends to share your tour and travel experiences with. The next day, after exploring the city with your guide, the tour will depart Christchurch along one of New Zealand’s most popular tourist routes and head to our accommodation in Ohau, passing through the spectacular Mackenzie Country and stopping at Lake Tekapo for some photos or a scenic flight if you’ve selected it as an option. As if the turquoise lake isn’t picturesque enough, Lake Tekapo has a grand backdrop of New Zealand’s highest peaks and really is a scenic highlight, but don’t worry, there is a whole lot more scenery to come! On the third day of the tour, we head to Queenstown for a few days of exploring this adventure mecca. Whether you’re an adrenaline junkie, an avid hiker, wine taster or scenery lover, Queenstown has something for absolutely everyone. With two nights and plenty of daylight hours here, get ready – this town certainly knows how to live life to the fullest. Milford Sound is a considered a must-see option for Day 4. Whether you fly or drive, the scenery en route is as awesome as the destination. Once on the Sound, as you sail beneath thundering waterfalls and towering cliff faces you’ll understand why we call it the “8th Wonder of the World”. 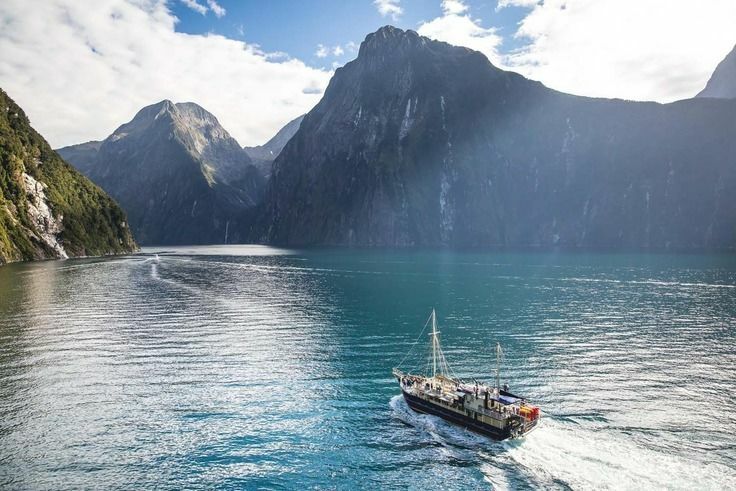 Tour Option: Milford Sound is one of Aotearoa’s most jaw-droppingly beautiful scenic highlights. On day five, we wend our way to Wanaka – one of New Zealand’s most beautiful mountain towns – stopping en route in charming Arrowtown, a historic Gold Rush village with heaps of old world character. Included on this day is a short boat cruise and a cycle through back country mountain landscapes. Fill your lungs with alpine air and your camera with Insta-worthy goodness. Wanaka has breathtaking hikes and easy bike rides for a welcome chance to relax, so we’re here for another day so you can get your fill. On day six you can choose to visit Mou Waho Island – accessible only by boat from Wanaka and famous for being home to an (unnamed) island, in a lake (Arethusa Pool), on an island (Mou Waho), in a lake (Lake Wanaka), on an island (the South Island) in the ocean (the Pacific!). Sounds complicated, but once you’re there it will all make sense! Enjoy a snack while watching the wildlife, but be sure to keep your food away from the wekas, as they’re very curious and determined! Some guests may choose to amp up the charm of this destination and take to the skies on a Tiger Moth flight over Lake Wanaka – it’s a spectacular way to admire the landscape. 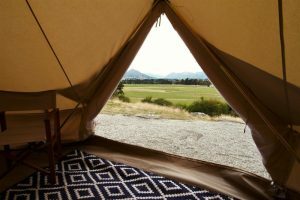 And to top off your time in Wanaka, tonight we stay somewhere really special that can best be described in four words: glamping with breathtaking views! Dinner tonight is also included and our mouth is watering even just writing about it! Sleep in style under the Southern skies. Sit back and relax on day seven, as your guide takes you on arguably the best drive of the tour from Wanaka to Franz Josef – many of our Haka Guides rate it as their most favourite drive in New Zealand. From the cascading waterfalls of Haast Pass to classic Kiwi coastal views, your guide will have some epic surprise photo stops and short walks along the way/ If you’re travelling with us between September and December, your guide will introduce you to whitebait – a seasonal and iconic culinary treat. You’ll arrive into Franz Josef – a UNESCO World Heritage Area famous for its spectacular glacier, just 5km from town, which is begging to be explored tomorrow. We’re treated to a lush rainforest stay tonight and tomorrow – the perfect surroundings to enjoy this beautiful location. You’re in Glacier Country now – what adventure will you choose? With New Zealand’s highest mountain (Aoraki/Mount Cook) twinkling behind the glaciers, Franz Josef is about as beautiful a setting as you can find. The Māori name for this part of the West Coast is Te Wahi Pounamu (which means ‘the place of greenstone’) because of the abundance of pounamu to be found here. Included in your tour today is a special opportunity to carve your very own pounamu pendant. There are heaps of ways to enjoy Franz Josef Glacier; weather permitting, to get up onto the bluest ice you can take a scenic helicopter flight and hike onto the glaciers. Maybe you’d prefer to kayak on a glacial lake; or just relax in steamy hot springs. As well as the awesome glacier activities, you could also try quad biking, horseback riding and even a spot of group karaoke tonight in Franz Josef! 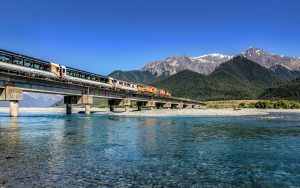 As you enjoy your Continental breakfast on the ninth day of the tour, you’ll probably be torn between thinking that you don’t want this tour to end, and also questioning whether New Zealand’s South Island can continue to deliver stunning scenery, well, today is the day where you will board one of the world’s most spectacular train journeys and head back to Christchurch. Covering 223 kilometres, the TranzAlpine train journey features epic vistas as you travel alongside the the ice-fed Waimakariri River, traverse the Southern Alps, and see miles of native beech forest. You’ll arrive back in Christchurch around 6.30pm – time enough to organise that last dinner with your tour mates. Phew! What an adventure! By now you’ll have lost count of the number of times you’ve uttered the words “Wow!”, “So beautiful!” and “It’s breath-taking!”. Sadly, all good things must come to an end, and on the morning of day 10, you’ll swap stories, memories and – hopefully – contact details with your new friends over breakfast before parting ways. We’d love for you to review us on Trip Advisor or Facebook so that other adventurers can experience the best of Haka Tours. Be sure to share your experiences with your friends and family, and tag us in on Facebook or share your images on Instagram. What’s the difference between a Haka Plus Tour and our normal adventure tours? All Haka Tours include transport, a passionate Kiwi guide, accommodation and breakfast, so what makes the Haka Plus tours extra special? A Haka Plus tour gives you room and space to enjoy your tour of New Zealand. You’ll be driven in comfort and style in a BMW bus, your twin-share accommodation will be 3–4 star, you have a bit more time to enjoy key destinations and your breakfast will be Continental and out of the box! Feast on 6 continental breakfasts and 2 dinners. 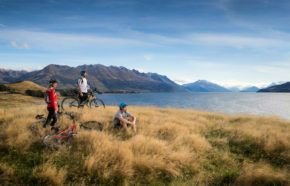 Cycle and cruise your way through Queenstown’s Mount Nicholas and Walter Peak Stations. What other activities can I do on this tour? You’re touring New Zealand’s incredible South Island, so you know you’ll be able to tick of some big items off your bucket list! Some of the most popular add-on activities on this tour are Skydiving in Wanaka or Franz Josef, Canyon Swing or Bungy Jump in Queenstown, a day tour of Milford Sound or the option to take to the skies and then hike Franz Josef Glacier on a helihike! But, it’s your tour, so you can select activities that are right for you: perhaps you want to take a scenic flight over the lakes and mountains, or maybe a 4WD tour of Lord of the Rings locations will satisfy your inner-film geek. Whichever way you want to adventure, we can accommodate your sense of adventure and help you try new things. Plus there’s four other Haka Plus tours designed to show you the best of New Zealand.